As part of the West Coast National Event of the Truth and Reconciliation Commission activities at UBC, four members of the Architecture Program of the UBC School of Architecture and Landscape Architecture will take this significant opportunity discuss their involvement working in project-based collaborations with First Nations communities in British Columbia and Yukon. The topics will address a broad set of issues and varieties of collaboration, including the professional, technical and cultural issues of planning, building and capacity building, design/build activities and youth education, storytelling and history, economic development and self-determination. 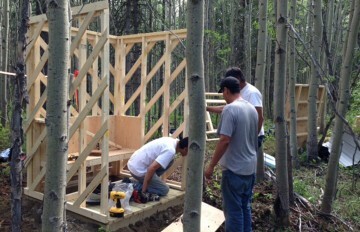 Building the outhouse at Tàkwàzhän. The public is welcome to attend, and coffee will be served.